One of the item mentions in the poem, Onion Bhajee (also known as pakora), eaten as a snack food or starter, is included here. Adjust the seasonings and chillies to taste. Sift the flour, baking powder, salt, and seasonings, herbs and chillies to taste. Mix well. Gradually add enough water to the flour and spice mixture make a smooth batter. Mixing very well so the onions are well coated. Preheat enough oil, to cover the battered onion, in a fryer to 180ºC / 350ºF. Carefully drop spoonfuls of the mixture into the hot oil and fry until golden brown. Drain on kitchen paper towel, serve hot. Repeat until all the onions are cooked. Zephaniah also wrote the foreword to From Dusk ’til Dawn: An insider’s view of the growth of the Animal Liberation Movement, a book by Keith Mann about the Animal Liberation Front. 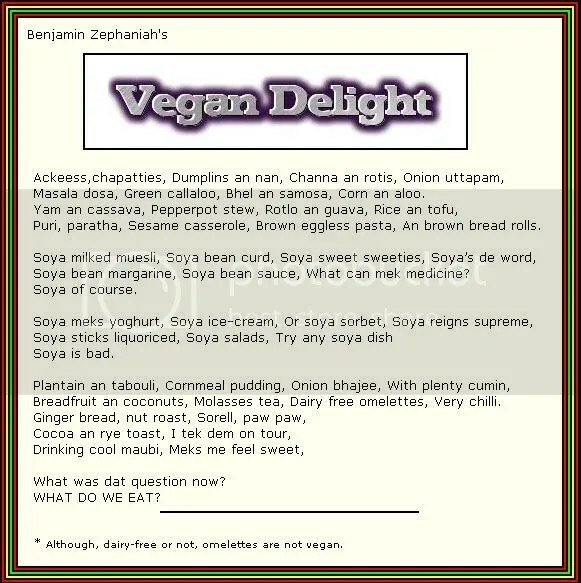 Speaking, here, in this video, Zephaniah talks about veganism, and how it has made him strong. Masala dosa, Green callaloo, Bhel an samosa, Corn an aloo. Puri, paratha, Sesame casserole, Brown eggless pasta, An brown bread rolls. Soya bean margarine, Soya bean sauce, What can mek medicine? Breadfruit an coconuts, Molasses tea, Dairy free omelettes, Very chilli. Although, dairy-free or not, omelettes are not vegan.